Nagavara Ramarao Narayana Murthy, also known as N. R. Narayana Murthy is one of the top industrialists and software engineer of India. He is one among the seven founders of Infosys Technologies which is an IT services company based in India. From 1981 to 202 he was the CEO of the company. In 202 he stepped down as CEO and started broadening his scope of activities to social services and promoting India globally. 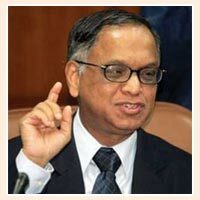 Narayana Murthy’s social vision and corporation has been appreciated worldwide. He is also the recipient of the Padma Vibushan. Although he has retired from the executive position at Infosys he is still the chief mentor and non-executive Chairman of the board.